Thanks to our Featured Foodie, thekitchenwitchblog.com, for this fantastically fun snack idea! How good do these look?! 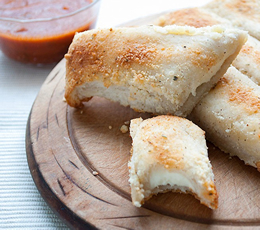 Unroll the pizza crust onto a parchment lined baking stone or or sheet. Using your hands, pull and shape it into a rectangle (approximately 12×8 inches). Remove string cheese from packaging and evenly space the 6 pieces of string cheese on one half of the dough. Carefully fold other half of dough over the string cheese, using your fingers, gently press and seal along all the outer edge and in between the string cheese. Lightly brush the top with melted butter or olive oil, sprinkle with garlic salt and the grated cheese. Place lined baking sheet with breadsticks into the oven on the middle rack and bake for 13 to 18 minutes or until golden brown. When finished, remove from oven and let cool slightly, use a pizza cutter to cut into breadsticks. Serve with warm pizza sauce for dipping if desired.